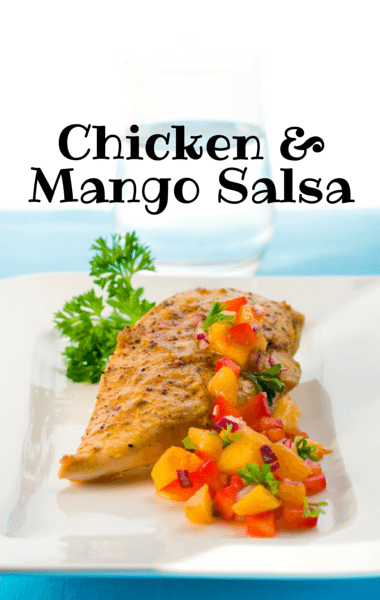 Clinton Kelly made a great Macadamia Crusted Chicken with Mango Salsa recipe on The Chew, the perfect quick recipe for kids to enjoy or to make for that special someone. Clinton revealed that this recipe was the first “real” recipe he ever made in his life, which was inspired by watching Mario Batali and other chefs on the Food Network sometime around 1993. He cooked it in a small, cramped New York apartment and made it work, so there’s no need for lots of kitchen room, either! Check out my attempt to reproduce this recipe below! Put the flour in one dish, the eggs in another, and the bread crumbs and macadamia nuts in a third. Using tongs, dip the chicken in the flour first, then the egg, and finally the bread crumbs. Add a drizzle of canola oil to a saute pan. Use canola oil instead of olive oil so the flavor doesn’t compete with the macadamia nuts. Bring the saute pan up to a medium high heat and add the chicken. Cook the chicken on one side for about 3 to 5 minutes, then flip and cook the other side for the same amount, until cooked completely and a nice golden brown. Meanwhile, mix together the salsa by add the mango, cilantro, pineapple, scallions, juice and zest of 1 lime, and jalapeno in a bowl. Serve the chicken on a plate with some of the salsa on top! If you’re serving this for kids and they don’t like the look of the salsa, puree it instead and serve it as a dipping sauce.